In a business of monthly comics, longevity and shelf life are taken for granted. The result is often a disposable medium giving rise to a disposable culture of one-and-done stories and story arcs. Inheritors of the American pulp magazine tradition, these comics are read, barely digested, and then packed tightly away in collector baggies. Even the graphic novel medium often suffers from this malady. Yet, it is the publishers such as Humanoids with viable back catalogs that give the business its legs. And, it is the slow burn comics like Carthago that stick with readers long after recycled, monthly superhero antics have dissipated away. Originally published in France in separate volumes, this English language edition of Carthago collects all five books together. In this magnificently illustrated book, half by Eric Henninot and half by Milan Jovanovic, readers are taken on an adventure that spans millions of years of animal and planetary evolution. A step away from Humanoids' strengths in the interstellar, science fiction genre, Carthago delves deeply into the underwater realms of prehistoric, ancient creatures long thought extinct. 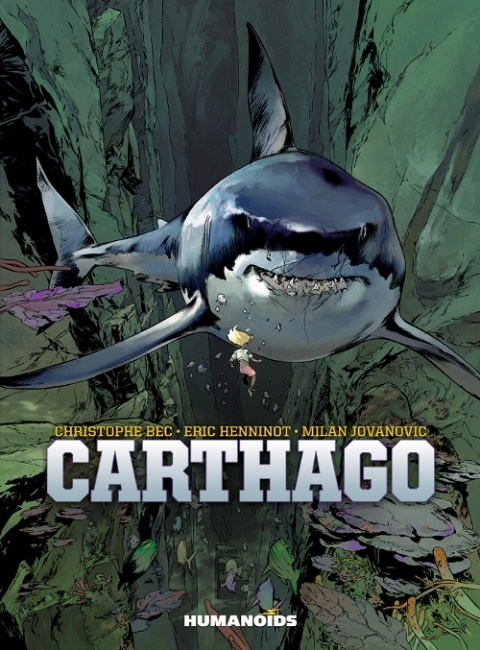 While the extensive cast of characters is quickly introduced and Christophe Bec often jumps around in their debut and development, leaving some readers in a brief who's who dilemma, audiences will immediately realize the real protagonists, at first, are in fact the antagonists of the sea--particularly the Carcharodon Megalodon, the ancestor of the great white shark. 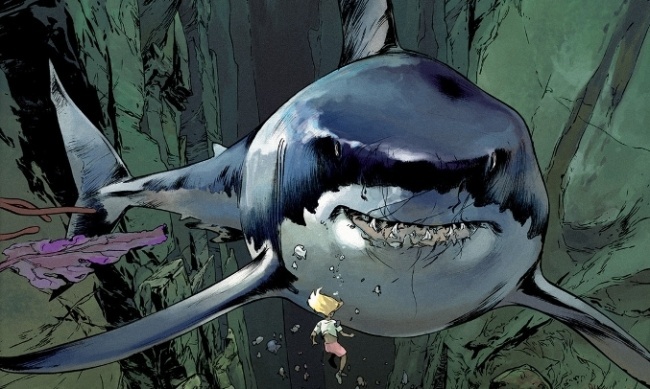 Where did this Megalodon come from and what is its connection to the appearance of other ancient, often times mythological creatures that spring up throughout Carthago? 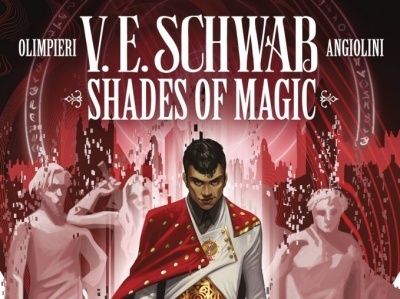 This is the great mystery Bec, Henninot, and Jovanovic weave throughout the book. Peppered with various attacks and random sitings throughout the millennia, Carthago demands more from its readers than just a simple, straightforward plot. Thrown into this mix are a varied cast, including scientists, a global energy conglomerate, billionaire explorers, environmental activists, and a bizarre young girl who may hold the answers in this earth-spanning, timeless quest. Adding to this intrigue is the role of Professor Nobuaki, a questionable academic whose career has been built on the claimed discovery of submerged, lost cities. If that were not enough, there are militant Buddhists, World War I German submarines, a futuristic underwater bathysphere, an amusement park, and even a Yeti and Legos. This brilliant narrative is fully recognized by the shared duties of Henninot and Jovanovic. 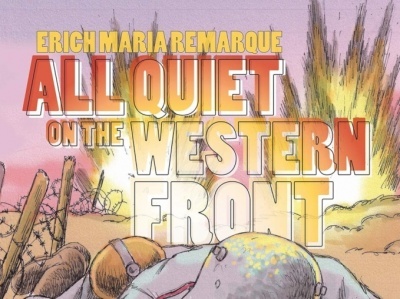 The seamless shift between artists allows for a smooth transition and both artists call to mind the influences of Euro-comics masters Moebius and Manara, especially in the ways they capture facial emotion, body language, and the detailed intricacies of the changing environments found in the story. Both the simple and the complex panels are striking in Carthago, combining brutality with beauty. With so much going on in Carthago, some readers might fear that this "kitchen sink" approach to storytelling will be long in quantity, but low in quantity. Nothing could be further from the truth. Humanoids has already cemented its dominance in producing superior science fiction comics. Carthago represents something new for the publisher and it does not disappoint.